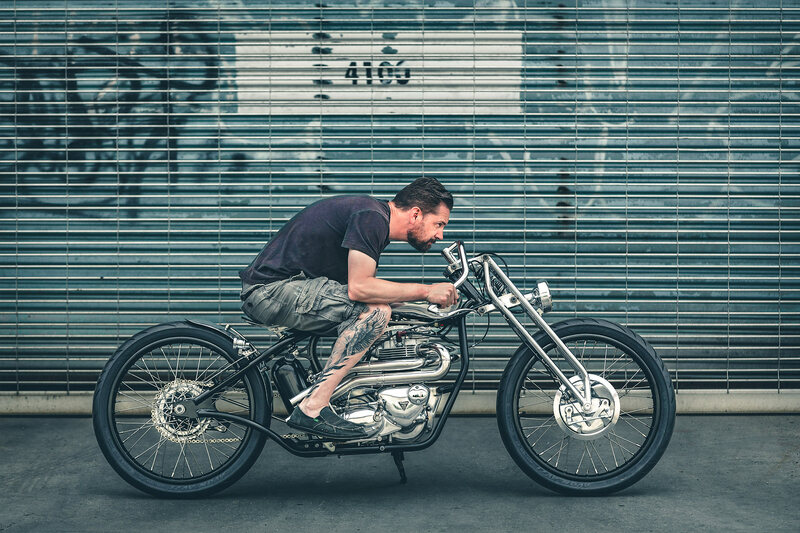 When you’re a builder who has done it all and get to build amazing machines everyday for your clients, occasionally you need to set yourself a challenge so daring you just might fail. 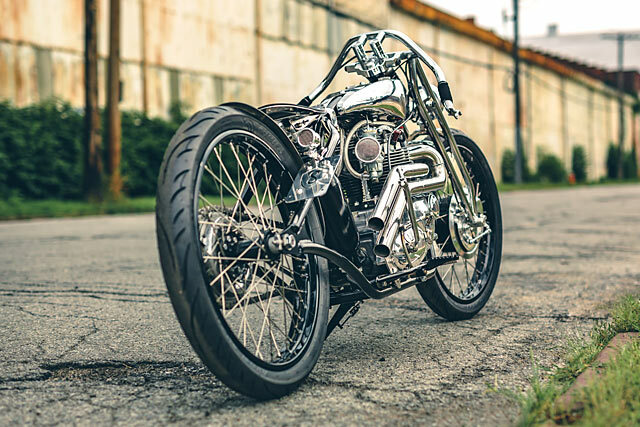 When it comes to his personal projects Rob Chappell of Origin8or Custom Cycles in Ontario, Canada, admits he can get easily bored and needed renewed motivation for his next bike. 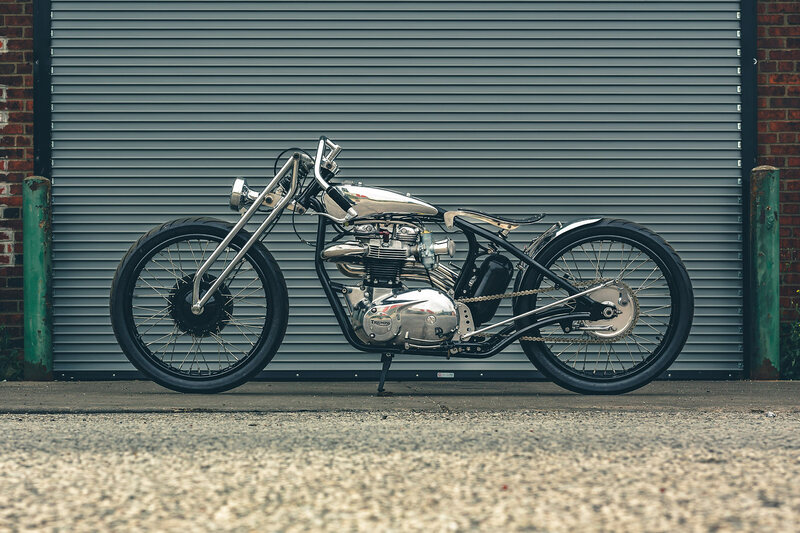 The goal he set himself was to build a one-off, hand crafted, old school custom, with a tight deadline that simply had to be met. 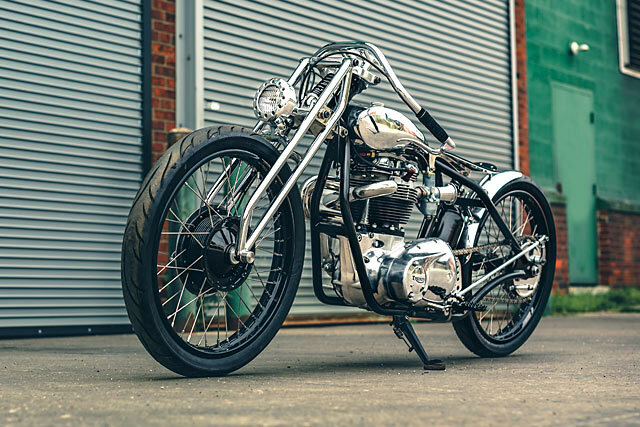 Despite some hiccups along the way he’s burnt the candle at both ends to deliver this incredible ’69 Triumph Bonnie Board Tracker. 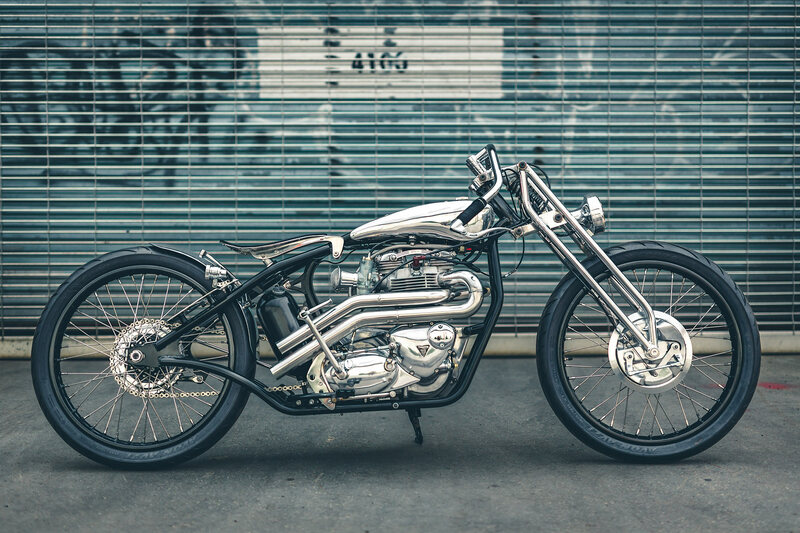 There was no set plan to begin with, just a winter itch that needed to be scratched and a handful of parts. “I finally have a new shop out back so my front garage shop is now my machine shop and the back shop is assembly and fabrication. I had finished up the Rebel build and filming was over so I was working on a customer’s 2013 Triumph Bonneville over the winter and planning what I wanted to make for the summer show season, collecting a few parts here and there. 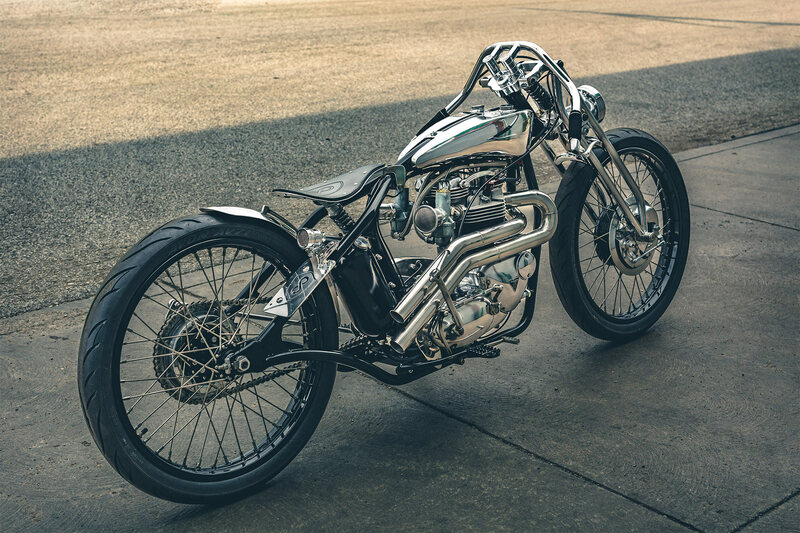 I came across some reverse levers and internal throttle from Speed Machine Motorcycles that I knew I wanted to build a bike around,” explains Rob. In the corner of his shop sat the 1969 Bonneville that would be joined by the newly purchased levers, a set of rims and other odds and ends that would serve as the basis for the build when all the clients work was finished. 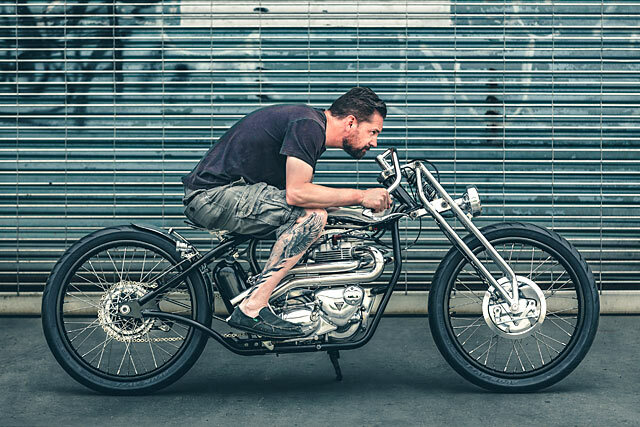 Rob’s plan was to have the bike complete for the Freedom Machine show in early July and Fuel Cleveland, USA towards the end of July. Just one problem, by the time April had rolled around he still hadn’t started and with just a few months to go till show time all he had was a pile of parts in the corner; that boredom was now a thing of the past! The first step was to pick up a MK7 builders kit from Dave at Voodoo Vintage but keen to set yet another challenge Rob decided “for this build I wanted to push every skill set I had, and in some cases learn some new ones. 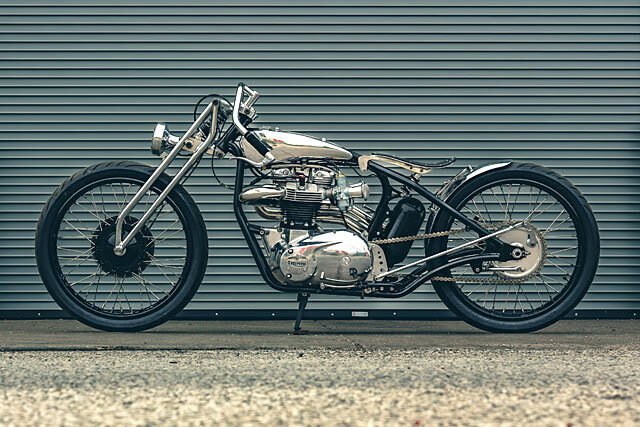 I wanted most of the bike to be hand built.” So he fabricated a rotisserie frame jig and downloaded the frame plans only to discover it was much longer than he’d wanted. Spec’d to be 64 inches axle to axle Rob aimed for 56 and re-designed the frame before shortening the back end, narrowing the frame, changing some angles and altering the backbone. 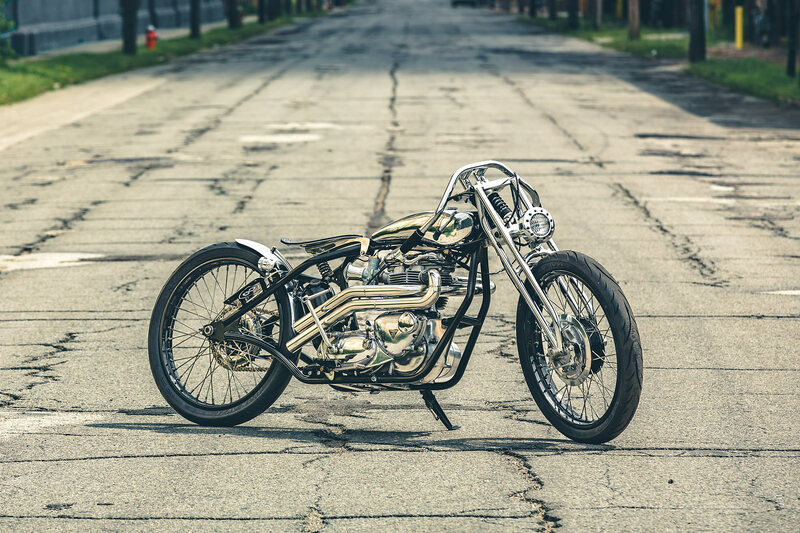 With his own drop-outs and engine mounts, she’s running 35° of rake with 8” of trail, all beautifully TIG welded together by the man himself. 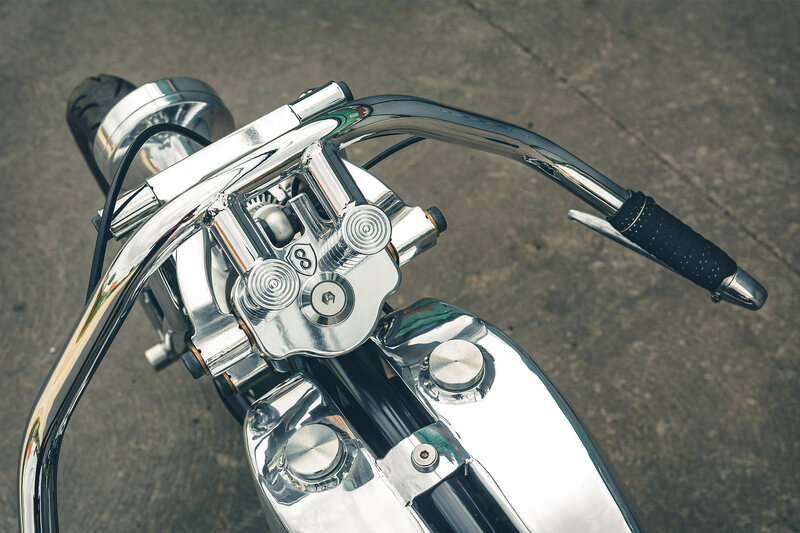 Rob fabricated the risers that sit the bars out 2.5inchs forward in Board Track style, with those inverted levers and hand-wrapped leather grips they look absolutely brilliant to finish out the front end. 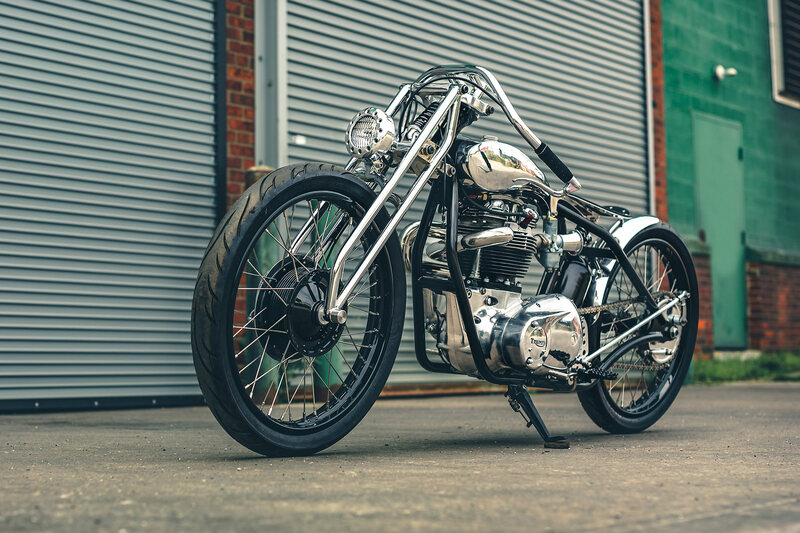 Utilising the stock Triumph hubs, Rob laced them to a set of 21in rims he found on eBay with custom stainless spokes from Buchanan’s. The tall and skinny Avon Cobra’s measure 80/90-21, giving the right look and you have to bet the poor buggers racing on wooden Motordromes a 100 years ago wish they’d had some too. 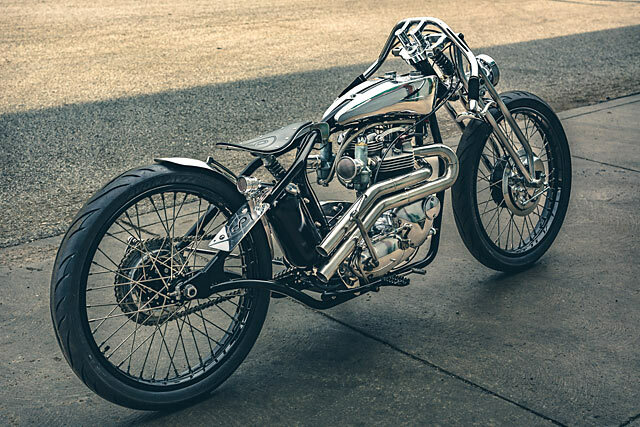 The rolling chassis was completed with Flash Fire Coatings powdering the frame and Metal Coaters taking care of the chrome. The bodywork is no less impressive and despite the deadline fast approaching Rob decided to tackle his first ever aluminium tank and hey, seeing as we’re going for a challenge he opted for a split design. Wanting the engine to dominate the visuals, the tanks are deliberately small but still hold a very useful 1.3gallons. It wasn’t all smooth going though, having to trash and remake one side but the end product was more than worth it effort. While Rob worked on the alloy and fabbed an oil tank he had Aaron Richard at Revive make the rear fender. 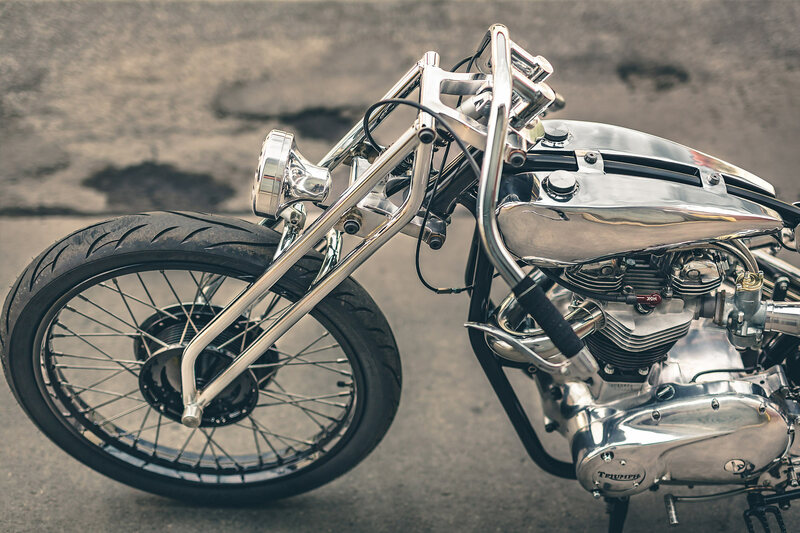 Within two weeks it was back and Rob fabricated the stainless steel mount that has the fender hovering over the tyre brilliantly. 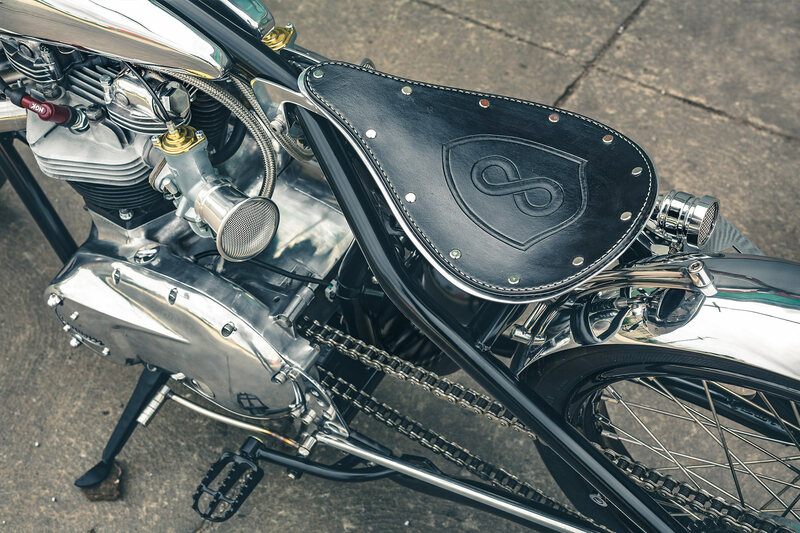 In another collaboration Rob split the work on the seat with a friend, Adrian @8x6customworks in Scotland. “I warned him of the timeline I was under and he literally had shipped me back a leather seat pad in less than 8 days. On top of that he made me two, one with my logo and one without – what a champ!” smiles Rob, who took care of the pan, mounts and shock. With two weeks left to go a friend was brought in to help polish all the case covers, valve covers, fender, gas tanks etc. “Surprisingly, he’s still a friend,” laughs Rob, with the two spending every single night on the job. 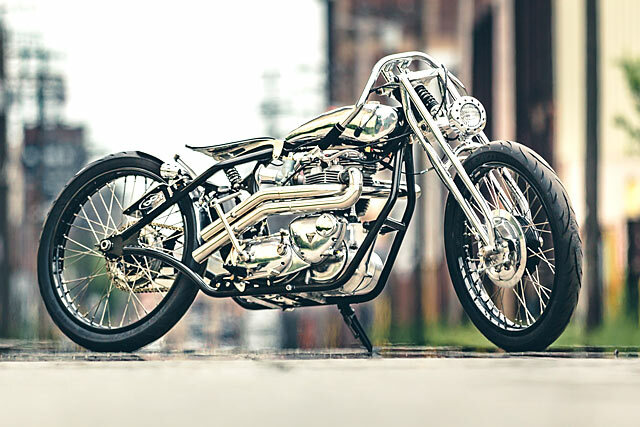 Once again Scott Cartier and Hindle Exhaust came to the party bending up a beautiful set of pipes. To Rob’s incredible disappointment the Triumph wasn’t running for the Freedom Machine show, although it still looked a treat. 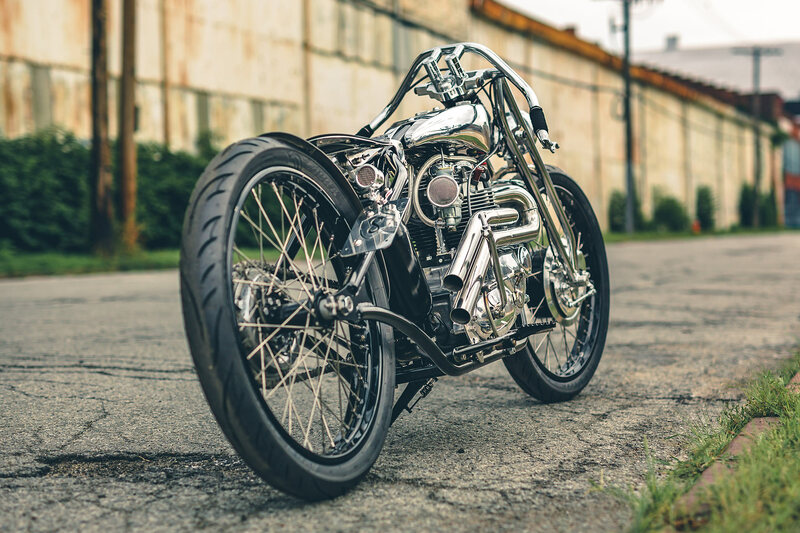 So back at the workshop the engine was finished up, wiring completed and a weak original rotor was replaced with a part from Lowbrow Customs. With it all running as a battery-less system with a Pazon ignition, Boyer light delay box and a single coil, you just kick her and go. And it was off to the USA, “I managed to convince my photographer friend Ben Quinn to come along for the Fuel Show. The following day we went out in the street and got these amazing shots.” enthuses Rob, who is rightfully chuffed with the brilliant ` Board Tracker that took on boredom and won.